Ex-Tottenham star Chris Waddle has warned them that keeping Christian Eriksen is “vital” if they are going to compete against the top clubs. Talks over a new contract between Spurs and Eriksen have made little progress in recent months, which has led to reported interest from both Real Madrid and Barcelona. 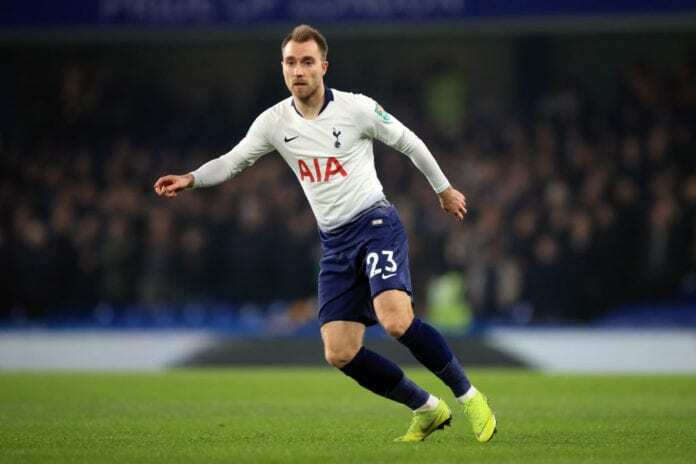 The Spanish giants are understood to be keeping tabs on the situation at London with Eriksen’s current contract to expire in June 2020. Recent reports have suggested that Real could be about to offer a surprise swap deal involving James Rodriguez, whose loan deal at Bayern Munich will expire at the end of the season. But Waddle believes it’s crucial Spurs do everything they can to hold on to the in-demand Danish playmaker. “If Tottenham let Eriksen go, they won’t be able to replace him,” Waddle told Sportingbet. “He is a top player who anyone would be interested in signing and if Tottenham want to be seriously competing against the top clubs these are the types of players they need to keep hold of. “Eriksen is vital to the club, especially as they move into their new stadium. On the other hand, Waddle does predict a brighter future for Spurs once they have finally returned to their rebuilt White Hart Lane stadium. The former England international expects Spurs boss Mauricio Pochettino will soon be making “£80m signings” after the struggles in recent transfer windows with the club set to not make a single signing again this month. “I think Daniel Levy will give Pochettino the spending power of Man City and Liverpool once they move into the new stadium,” added Waddle.